Readers know that I am a big fan of the computer games created by the team at Amanita Design (http://amanita-design.net/). I like playing their games because of the creative problem-solving scenarios that float within the frame of a story. And so do my grand kids. In earlier posts, I've reviewed three of their games, Samarost I (free), Samarost II, and Machinarium. The creativity at Amanita Design is even reflected in how you navigate through their web site. The home page is blank except for a curious object in the lower right corner. Click on one of the white buds and it blossoms to a new stem with more white buds. Click on the indicated buds to get to the Flash Games screen. All of Amanita's games can be reached from this screen but for this post, click on Questionaut. This short, one-minute video starts the story. An unnamed character, sitting on a cactus at the top of screen, has its hat blown off, sending the Questionaut on a quest to retrieve it. 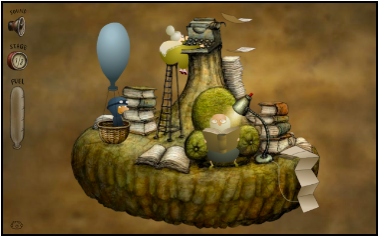 At each of the eight levels, the Questionaut has to correctly answer questions in order to collect and store enough helium to float up to the next level. Answering a question correctly adds a bubble of helium to the collection canister at the left side of the screen. Answering a question incorrectly pops one of the bubbles already in the canister. The questions keep coming until you get a total of five gas bubbles. 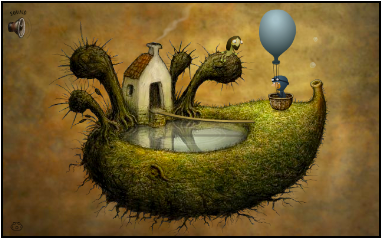 Then, away you (the Questionaut) float to the next level. The first level shows grand dad reading a book as grandmother types away on her antique Remington. For myself, and probably kids, the most fun comes from solving the point-and-click problem that starts each level. For example, to get the questions at level 1, you have to shift grandad's attention away from his book. If you get stuck, send an email and I'll give you a hint. Not the answer—a hint! 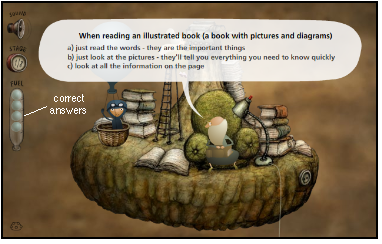 Consider the question, When reading an illustrated book (a book with pictures and diagrams), asked in the following level 1 graphic. If you were to answer with c, ‘look at all the information on the page’, you would be correct and the fifth bubble would fill the canister and be transferred to the balloon for enough lift to get to the next level. There has to be a large number of questions in the data bank. I've played through the game four times with very few repeat questions. It took Amanita two years to give us Machinarium. I hope I don't have to wait that long before I can play their next major product.